Well my college career has come to a close and so has my time on this wonderful blog. As one final hurrah to the great experiences I have had at UMD I will share some parting words for those who are continuing their journey. Part of you college experience is to live a different life that transitions you into adulthood. To do this you can expand your horizons by exploring the city you live in. Take a weekend, rent some camping equipment from the RSOP and go find an adventure with some friends around Duluth. This city has so much to offer in terms of parks and trails which are very close to and in the city. Even if it’s just for the afternoon, you can learn a lot about the place you live but you just have to get out and do it. Working can be an important aspect in your college career as it shows employers you can juggle numerous responsibilities while not neglecting others. It can help teach you discipline that can translate into a vital skill when studying. Also, you may pick up a few useful skills to add to your resume. Of course, school is paramount to your college experience and it’s essential that you focus on doing well because it can decide what kind of job you get after graduation. Luckily, this blog covers how to do well in school by managing you time and taking advantage of all the resources provided on campus. Don’t think that you can only go to class and look good to potential employers right out of school. Get involved in clubs, both academic and non-academic, as well as extra programs offered in your respective schools. Seeing as how it is summer and many of you returning may not have much to do in regards to classes there are opportunities online where you can take classes at your own pace and learn a new skill or simply enjoy the knowledge from taking a class. The semester may be ending in a couple of weeks but that doesn’t mean the workload is winding down. For many of us, projects and papers are due while finals are looming down on us. This is a perfect opportunity to make sure you are making the most out of your classes while not getting overwhelmed. It is important now more than ever to make sure you are efficiently using your time to study for your finals. One tip not many people know is that taking notes by hand can help you remember information for a longer period of time. In a study from Princeton and UCLA they found that processing information is improved when taking notes because you have to actively summarize information. Also remember that if you are trying to learn new information try to find a quiet environment and put down the headphones because it may impair your information retention abilities. And beware of burn out by spacing out your study hours ahead of time to make sure you have enough time to study without cramming at the last minute. Active learning, such as self-testing, is monumentally better than passively re-reading notes. If you would like to learn more about studying better without burning out check this link. When school starts to pile up, our diets in college take a hit, which can be detrimental to you studying and focus. It is vital to eat protein in the morning to hold off the hunger until noon time while remembering to eat small healthy foods and drinking plenty of water throughout the day to make the energy last. While eating well and studying may be critical to finishing strong this semester one must remember that getting enough sleep is just as important. Unfortunately, for a lot of us it isn’t possible to get a full eight hours so naps during the day have to make up for that. If you’re looking to boost energy, a ten to twenty minute rest will likely suffice. However, any more than that and you risk feeling groggy. If you sleep for a full 90 minutes you can eliminate that feeling while getting some REM sleep. If you’d like to know more about the optimal nap check this link. Finally setting goals for what you want to get out of this semester can go a long way to providing direction to your studying. Even just creating a simple but doable list for the day can keep you focused and make you feel accomplished when you finish. Interviewing for a job is something that we must all face when pursuing our career track. Many of us prepare our resumes and polish our skills but sometimes that isn’t enough to get us the job. More and more companies are looking for the right fit in their positions that align with their company culture. Forbes recently did an article that reported on the top five personality traits employers hire most which showed many companies hire differently that one might think. Professionalism is critical to impressing an interviewer and since first impressions are usually what this characterizes it is important to act in such a manner. Turning off your cell phone, smiling, standing and shaking hands, and general politeness can go a long way to improving your chances of landing that job. Also, following up after the interview with a thank you card shows good manners and solidifies how well your interview went with the employer. Being engaged in the interview and asking questions can demonstrate your interest level and critical thinking for the position. With this trait it might be easy to go too far and become almost animated in your interview. Rather, use your high energy when going into depth about various questions and try to maintain eye contact without staring. If you have both high energy and professionalism then confidence should come naturally. Body language can tell a lot about a person and you want it to tell your interview that you know your stuff and want the job. Be sure to stand up straight and do not make overly grand gestures with your hands. Being prepared can also boost your confidence since you will be focused on the questions at hand rather than the answer you forgot to prepare for. This trait has less to do with first impressions, like the first three, and more to do with how you craft your experiences. Employers like to see that you were able to handle a situation independently or excelled without direct supervision. When answering questions give situations where you took the initiative, what was the outcome, and what you learned in the process. Depending on your chosen field, there might be a need to learn new ways to complete projects or adopt a new method of solving problems. If this is the case then you may want to craft you interests as someone who is forward thinking and enjoys new things. If you show that you enjoy learning outside of the workplace then it is easy to assume that you enjoy learning them during the hours of 9 to 5. Of all the traits that employers look for, confidence is the trait that is most lacking according to employers. It is important to note that the top three traits are all solely based on how well you present yourself and act during the interview, while the others are crafted upon your experiences. This says a lot as to what employers truly value and look for in a candidate and harnessing this knowledge could help you land that job. These positions that are posted periodically in the UMD employment website allow students to work with professors on projects in their particular area of expertise. Here is an outline of what this kind of work entails. Provide expanded experience in coursework already taken: If you have a desire to work in research or are genuinely interested in certain topics, this is a great opportunity to explore your field. Naturally when you take a research position in your discipline you will be going more in depth into classes you’ve already taken. Allow you to develop self-discipline and organization: Typically the professor you work with will give you an assignment and you will complete it on a deadline in order to get the research done in a timely manner. This will give you skills on how to manage your time between work and play, which is vital if you want to succeed. Get to know a professor: Professors are people too and they are here to help you in your career, so working with them is a great way to understand how they got to where they are today and possibly find some connections to what you want to do in the future after you graduate. For some of you who may not know what a UROP is it’s an Undergraduate Research Opportunity Program. This is a program that allows students to conduct their own research on a specific topic in their discipline. Here are some of the aspects of a UROP. Work independently: If blazing your own trail is more how you live your life then this is a wonderful opportunity to craft how your research will turn out. With the guidance of a professor you choose to advise on your project, you can develop meaningful analysis that drives your discipline. Explore a topic that truly interests you: Although you will have to get your topic approved by UMD, as long as your topic is relevant and provides meaningful discussion in your field, the sky is the limit. Get funding from department: Did I mention you get money to do this? Depending on the length of the project the University of Minnesota Duluth will compensate you for your hard work. Present topic: One great opportunity to showcase your accomplishment is presenting your results. Students who complete their research project are able to present in front of the National Conference of Undergraduate Research as well as the UMD Undergraduate Research/Artistic Showcase. Although this is not required it is a great skill to be able to present in front of your colleagues. Add to your resume: Beefing up you resume is important and completing a project like this shows a lot of great qualities to employers. Both Undergraduate Research Positions and UROP’s create a new area of learning that you should definitely take advantage of in the future. From developing skills that may help you in your career to learning about something that interests you these programs can help shape your college career. Although we may be busy with our day-to-day schedules from school and homework it is important not to neglect expanding our scope activities beyond the classroom. Getting involved in a student organization can provide numerous benefits to your college experience and help you in the future. Here are some examples of why joining a student organization is one of the best decisions a college student can make. For some of you, crafting a resume may not seem like something you’ll have to do for a while but as with anything it helps to start early. Being able to add that you participated in an extracurricular activity is something that employers value. However, choosing the right student group is vital as well since a group like the gaming club will not have as much weight on your resume as the accounting club. Of course, this doesn’t mean that you can’t join both but rather that one is geared more toward a career track. If the group you pick is related to your major then it’s even better because it’ll show that you’re serious about your career. One great aspect of the college experience is the amount of people that you could potentially meet that are in the same shoes you are in. You can have the opportunity to meet some of those people at a student organization. Building relationships that can become professional contacts is a great way to prepare you for the job hunt and hopefully the workplace. Some student organization host speakers and have professionals come in to network with students which can put you ahead of other students and give you a first hand look at what options may be available in the future. If you are worried that involvement in one or more student groups may hinder your schoolwork then rest assured because studies show that most of the time it actually helps you in school. Time management and focus had a great deal to do with improving your academic performance. Joining a student organization doesn’t have to be all work and no play; join something that you enjoy but can also benefit you in the future. And with UMD boasting over 250 student organizations there is something for everybody. Read other posts written about on-campus involvement. Many soon-to-be graduates are on the job hunt but many have not considered a job in government. A career in government can offer benefits that the private sector simply can’t. For instance, because the government is not dependent on market forces it doesn’t fall victim for recessions in the same way that the private sector does. This means that a career in government is great for people who value job stability. For young people, working for the government can provide experience that is often times required to get hired elsewhere. But some of you may ask if a career in government is applicable to your major. Rest assured there is likely an opportunity right up your alley. The USAjobs.gov is a great resource for those searching for their first job. Here is a general list of the fields within the federal government. Most of these jobs are not located in Minnesota so it provides a great opportunity for those willing/wanting to relocate to do so. However, for those of you not wanting to leave this wonderful state you can check out the Minnesota government website here. They have an updated database of jobs around the state, many of which are entry level. Consular Officers facilitate adoptions, help evacuate Americans, and combat fraud to protect our borders and fight human trafficking. Consular Officers touch people’s lives in important ways, often reassuring families in crisis. Economic Officers work with foreign governments and other USG agencies on technology, science, economic, trade, energy, and environmental issues both domestically and overseas. Management Officers are resourceful, creative, action-oriented “go to” leaders responsible for all embassy operations from real estate to people to budget. Political Officers analyze host country political events and must be able to negotiate and communicate effectively with all levels of foreign government officials. Whether you want to travel the world or make a difference at home a career in government can empower you to make that decision. It’s that time of year when many students have to decide what they are going to major in to prepare themselves for a career. Registering for classes may be a daunting task for those that aren’t quite sure on what they are majoring in or aren’t confident to think they’ve made the right choice. 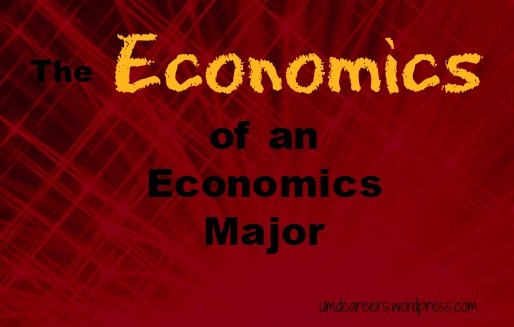 Rest assured that I may have found the answer for some of you: become an economics major. Economics comes from the Greek words ‘oikos,’ which means house, and ‘nomos,’ which means rule or law. In essence, it means the study of rules of the household. In the modern realm of economics, it has been expanded to include the household’s decision making processes to sectors of an industry to entire economies of the world. The profession seeks to derive order from a seemingly chaotic world of spontaneity to understand not only how the world works down to the individual but also to predict the future based on the patterns of the past. Naturally, the major will develop these interests that you may have into skills that are valuable in the long run toward a career in different industries. Because economics covers a wide range of skills, economics majors have very diverse career paths. This offers a wide range of options for someone that may feel more at home in the public sector rather than private or healthcare over banking. Here are some fields and positions within those fields that employ economics majors. These sectors all demand people with the same skills that an economics degree provides, yet for those that want to further their career within academia and also to expand their career opportunities, graduate school can cater to those needs. And if you’re worried about not getting paid for your hard work, economics majors are the highest paid in all the social sciences and fair very well in the graduate follow-up report. Although deciding on a career field may be a lot to think about, taking an introductory economics class can help your decision making process.